Ashamed to admit it, but Just sat through all of The Perfect Man. Yuck! Can’t anyone make a good romantic comedy anymore?? Oh! Spam musubi, how could I have forgotten you? No list of favorite dishes can go without. Twenty-Five for $25 is over. We’ve now been to over twenty of the listed restaurants (though not all in this month! ), so at this rate by the time December rolls around they’ll all have been hit. This March’s biggest hit has to have been Sazerac, whose complimentary corn pan bread was absolutely to die for — so soft, basically corn meal suspended in sweet butter — along with a wonderful entrée in cider glazed pork ribs (plentiful and oh-so-tender) accompanied by tangy green chile posole (if you know me, you know that’s all I had to hear!). Their gumbo was tasty, too, if unconventional; they used duck and other unexpected ingredients in the recipe. As far as gumbo goes, though, BJ’s will always be my first love. Those who ordered chicken were less enthused, but. I mean, cider glazed pork ribs! They should’ve known better. Other restaurants this month: Szmania’s (ordered off the regular menu, as I was in the mood for jägerschnitzel; very happy to have done so, though portion size was gargantuan), Nishino (pretty good, but think I’m becoming jaded by pretentious, haute cuisine sushi — give me fresh and simple any day), and Yarrow Bay Grill (everything sampled — calamari, crab cakes, asparagus soup, lamb stew, divers scallops — was quite tasty). Have discovered Musashi’s in Wallingford, a busy hole-in-the-wall “Japanese diner” (to quote a friend), under weathered purple awning on 45th. Sushi selection is good, if limited; no frills, large cuts of fish, decently fresh. It’s no Shiki, but is decent, filling and cheap: a well-stocked nigiri plate goes for under ten dollars, while plump single pieces go for a buck and a half. Their bento box is even better, also under ten, but my favorite really has to be their onigiri (grilled salmon inside a rice-and-furikake-ball wrapped with nori) — big, tasty, and which give spam musubi competition in the race for best rice-based handheld snack (you get two for $2.75). 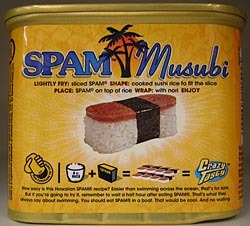 How easy is this Hawaiian SPAM® recipe? Easier than swimming across the ocean, that’s for sure. But if you’re going to try it, remember to wait an hour after eating SPAM®. That’s what they always say about swimming. You should eat SPAM® in a boat. That would be cool. And no waiting.